Curious about which areas of medicine have more problems with overdiagnosis than others? Wondering in which fields the problem has been studied extensively? A group from the Netherlands has looked into this extensively in their paper: Overdiagnosis across medical disciplines: a scoping review for BMJ Open. One of the biggest challenges in exploring this area is that the problem of 'too much medicine' goes by many different terms, these vary from place to place, and even where the same term is used there is disagreement about definitions. Jenniskens, a PhD student at Utrecht University, et al looked at almost 5000 studies and included 1581 for review. Unsurprisingly, the majority of papers pertained to the field of oncology, perhaps because wide-spread screening programs and attempts for early diagnosis are much more common for cancer than for chronic disease and other conditions. Though they did not publish the information, they also took a moment to determine from where in the world the papers were being written. For years, I have been fascinated with the geographically diverse response to the problem of overdiagnosis and the idea that overdiagnosis can happen in resource-rich and -poor countries alike. I worked with Alan Cassels to facilitate a group discussion at the Preventing Overdiagnosis conference in Barcelona in 2016. We identified movements that attempt to combat overuse of tests, treatments, and procedures around the world (presentation slides are available here) and discussed what factors in each region might be playing a role. Seeing that presentation and recognizing my interest, Mr Jenniskens has since kindly provided me with a breakdown of the country of origin of the authors for the papers analyzed in his group's review. While most of the papers were tied to the United States, first authors from 65 different countries were among the 1581 papers. 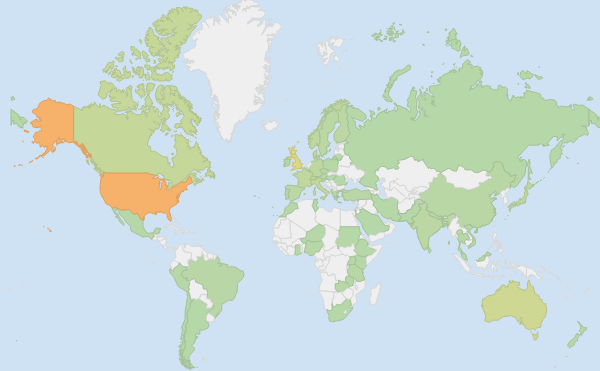 Grey - no authors; Light Green - few authors; Orange - many authors. Please click through to interactive map to view the % proportion of authors of the 1581 assessed papers, originating from each country. From Albania to Zimbabwe, it is clear that overdiagnosis is a global concern, and is being researched everywhere. Read more about the papers considered in the scoping review. When it comes to statin dosing, um, what is the right dose? Anyway, they do know a lot more about statins than they know about hockey; this is the fourth in a series of 5 shows devoted to critical appraisal of statin studies. The whole collection is here at Podomatic. The pair also run a blog at MedPage Today, Questioning Medicine; though less frequently updated, their posts are great at tackling some of the assumptions we make. Kayexelate to lower potassium? Maybe not that effective. Pelvic Exams? Probably unnecessary and likely harmful. What Joe and Andrew write always provides a gentle reminder to readers that our thinking "it might not help but it probably doesn't hurt" is off-base; there's plenty of evidence to back a change in practice for the better. Like their style? You'll also love the other groups that act as Evidence-Based Medicine champions and 'medical mythbusters,' providing sharp (and sometimes hilarious) critical reviews of the latest evidence. * While Tampa Bay did pretty well this NHL Playoff season, these guys will have to be careful about bragging about their success, given that the Lightening's roster is primary comprised of Canadian players.